NEW DELHI • India and China appeared to end a months-long military stand-off in the Himalayas, with both sides seeking to portray the withdrawal as a victory. 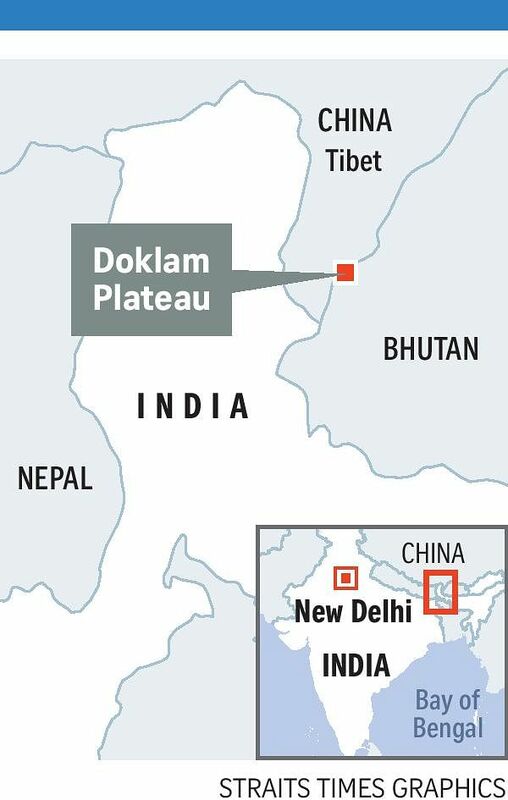 India yesterday said both sides agreed to an "expeditious disengagement" of troops at Doklam, a plateau near the Indian border that is claimed by both China and Bhutan. China's Foreign Ministry said later that India withdrew personnel and equipment from Chinese territory, and vowed to continue exercising "sovereign rights" in the area. The statements defuse the most serious flare-up between the nuclear-powered Asian giants since China won a border war with India in 1962. They also come days before Prime Minister Narendra Modi and President Xi Jinping are set to attend a summit of Brics nations in China. Brics gathers five emerging economies - Brazil, Russia, India, China and South Africa. "In recent weeks, India and China have maintained diplomatic communications in respect of the incident at Doklam," India's statement read. "During these communications, we were able to express our views, and convey our concerns and interests. On this basis, expeditious disengagement of border personnel at the face-off site at Doklam has been agreed to and is ongoing." India's Foreign Ministry did not immediately respond to a request to clarify whether both countries were withdrawing border personnel, or if Indian troops were unilaterally moving back from the contested area. China portrayed the development as a win, saying the army "has taken strong measures to safeguard territorial sovereignty and legitimate rights". The trouble started in June when India sent troops to stop China from building a road in the Doklam area, a remote, uninhabited territory. India said it sent its troops because Chinese military activity there was a threat to the security of its own north-east region. The somewhat confusing conclusion of the dispute is probably an attempt to give both India and China the ability to sell the agreement to their respective domestic audiences, said Professor Harsh Pant, who specialises in international relations at King's College in London. He said that China faced greater pressure to resolve the dispute because it would not want to host a Brics summit in the middle of a military confrontation. The summit is due to be held from Sept 3 to 5. "This is just a temporary solution," said Professor Jiang Jingkui, director of The India Research Centre at Beijing University. "Mr Modi will come to China to participate in the Brics meeting. But the relationship between the two sides cannot be repaired in one day."